Voluntary car schemes are available to people of all ages, who have a need to get to a healthcare appointment and for various reasons may struggle to do so independently. This may be because people are too unwell or unable to use public transport, don’t have access to a car or don’t have family or friends available to help transport them. Beeline have a team of volunteer drivers who use their own cars to provide a door-to-door transport service mainly to hospitals, clinics and other essential health services such as doctors’ surgeries, chiropodists, dentists and opticians. They can also provide transport to hospital visiting if capacity allows. Address: Coleshill Rd, Atherstone, CV9 1BN. All drivers are volunteers and use their own vehicle to provide the service. Services include; one way, two way, wait and return and support for passengers for medically related journeys. Medically related social journeys such as visits to hospitals or day care centres are undertaken, depending on driver availability. Address: Darlaston House, 4 School Rd, Bulkington, Bedworth, CV12 9JB. Warwickshire Community and Voluntary Action (WCAVA) transport service provides transport to a range of venues across the county and beyond, by volunteers using their own cars. For example, medical appointments, day clubs and activities. Address: 19&20 North Street, Rugby, Warwickshire, CV21 2AG. 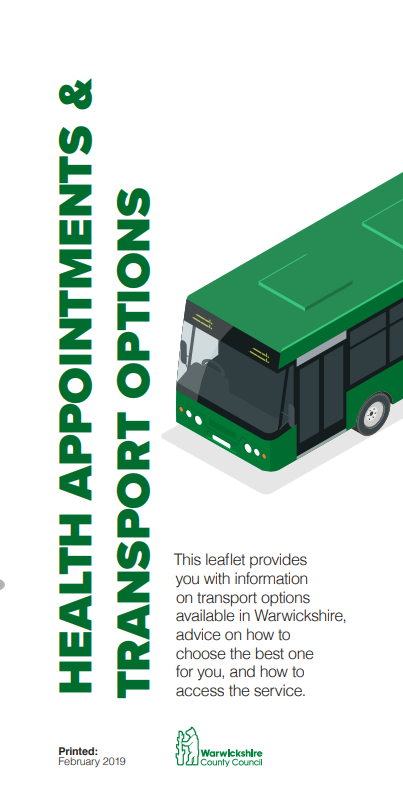 Transports people who are without their own transport to medical appointments at hospitals, doctors’ surgeries, dentists’ surgeries and day centres across Stratford District and beyond (including the Warwick district). The service regularly take people to the hospitals in Coventry, Birmingham and Oxford. A volunteer driver scheme for people who need transport to medical appointments. If you are a Southam /Napton resident with a genuine need for transport and have a bus pass or are over the age of 65 then you can access the service free. If you live in the adjoining areas of Bishops Itchington and Priors Marston then you can access the service but will need to pay the driver 45p per mile to cover expenses.